London: Financial markets gave the thumbs down on Monday to a landmark EU deal to deepen economic integration, pushing European stocks and the euro lower as investors judged its debt crisis would continue to deepen. But the capacity of the euro zone’s bailout fund was capped and it was not granted a banking licence. There was no sign the European Central Bank (ECB) was ready to take the stronger action analysts say is needed to quell the crisis - even if the ECB was reportedly back in buying Italian bonds on Monday. “Yes, we have a plan in place to tackle the longer term problems but...it doesn’t tackle the shorter term problems," said Peter Dixon, economist at Commerzbank. “I’ll be very surprised if it actually generates the results many EU leaders are currently hoping for." The euro was down 0.5% on the day at $1.3300, finding some support ahead of Friday’s low of $1.3280. It is now almost 6% below its October peak and 10% off its 2011 high of just under $1.50, struck in early May. 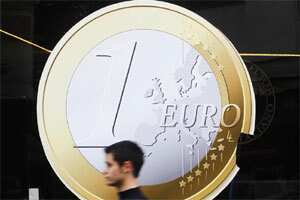 “There is a deflated feeling for the euro this morning after the EU summit. People were looking for a greater response and more importantly the ECB refused to significantly step up their bond buying," said Beat Siegenthaler, currency strategist at UBS. Moody’s Investors Service said it would look again at the ratings of European nations in the first quarter of 2012, judging the summit did not produce decisive initiatives and left the euro area prone to further shocks. “The absence of measures to stabilise credit markets over the short term means that the euro area, and the wider EU, remain prone to further shocks and the cohesion of the euro area under continued threat," it said in a report. The agency said the crisis remained in a critical and volatile stage, with sovereign and bank debt markets prone to acute dislocation which policymakers will find increasingly hard to contain. Bund futures were about 30 ticks higher at 135.83, after opening lower. German 10-year yields were 4 basis points down at 2.062%. However, 10-year Italian government bond yields jumped 22 basis points to 6.6%, pushing its premium versus German Bunds 18 basis points wider to 447 basis points. The 10-year Spanish government bond yield rose 15 basis points to 5.95%. An early test of sentiment toward European government assets will come later on Monday when France, the Netherlands and Italy issue new Treasury bills. The International Monetary Fund’s chief economist Olivier Blanchard said on Sunday the agreement reached by European countries was a step in the right direction but not a complete solution for the euro zone’s debt crisis. “What happened last week is important: it’s part of the solution, but it’s not the solution," Blanchard told the Globes business conference in Tel Aviv.